Seaport Homes is located on the eastern side of the Palos Verdes Peninsula in San Pedro. West of Seaport Homes is the Palos Verdes Peninsula, where residential home prices range from $1 to $20 million. 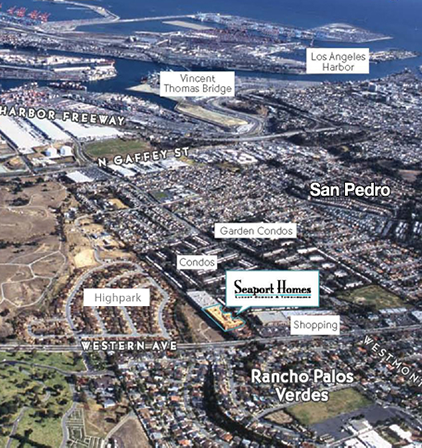 East of Seaport Homes is a spectacular view of America’s premier port, the Los Angeles Harbor of the City of San Pedro. South of Seaport Homes’ is a neighborhood shopping center anchored by Albertsons, Rite Aid, Wells Fargo, Starbucks and restaurants. North of Seaport Homes is Highpark, a proposed prime residential development.